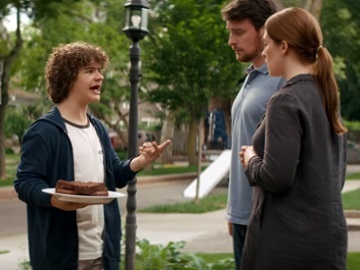 Gaten Matarazzo returns to the small screen in a new commercial promoting Fios by Verizon. This time, the Stranger Things actor welcomes his new neighbors with some cookies and tells them they will love the neighborhood, as it’s totally wired for Fios, meaning that it has fibre optics, which can move crazy amounts of data at even crazier speeds. “And Fios is a 100% fibre-optic network, so you can stream game and watch 4K shows all at once,” he adds. At this point, a neighbor listening to their conversation confirms that the boy is right about that and Gaten says to the new family that they are going to have fun there. The commercial ends with the voiceover mentioning that Fios by Verizon is a 100% fibre-optic network and 100% phenomenal and urging people to get the fastest speeds available for the best price with fios gigabit connection. Gaten Matarazzo, who plays Dustin Henderson in the Netflix sci-fi drama series Stranger Things, has starred in other Fios by Verizon commercials, pitching the “100% fiber-optic network”, which “makes your gaming system actually work awesome”. Verizon’s roster of spokespersons also include HBO’s Silicon Valley star Thomas Middleditch, who endorses Verizon’s 4G LTE Coverage and Unlimited Plan. Paul Marcarelli, who has worked for years as Verizon’s “Can you hear me now?” guy, switched to Sprint in 2016. In 2017, with the introduction of unlimited data wireless plans, the company started to add some of its actual employees to the commercials and systems performance engineer Ammara Bhaimeah was one of them, starring alongside lead pitchman Middleditch.